Over the recent years, more and more offices have been looking to change the way their workspace operates. Due to a rise in technology and social interaction between businesses, workspaces no longer need to be tiny enclosed boxes where employees are stuck for a day’s on end. A decade ago desks were filled with big box computers, mountains of paperwork and phone systems that were from the dark ages. Meaning employees needed large, isolated, individual workspaces. Now though, we have computers the size of A5 sheets of paper and all the information you would ever need right at your fingertips, stored in clouds, accessible from phones and tablets. So are these old large desks just a waste of space? And if so what do you replace them with? Old large desks, are they a waste of time? In most modern day offices, the answer to this is yes. 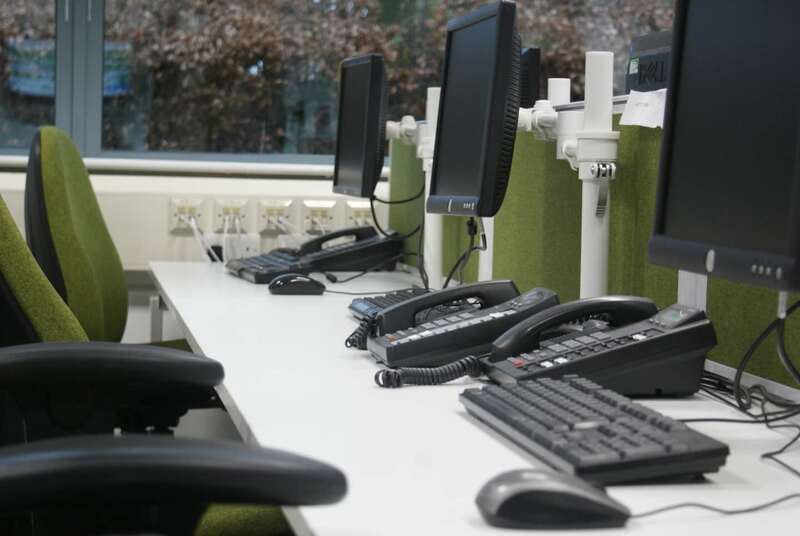 Using old style desk systems firms could be wasting up to 60% of usable space. More and more firms are now paperless and nearly all printers, internet hubs and scanners are accessed wirelessly in a remote part of the office. So what is actually on an employee’s desk? There is no longer a need for bulky screens, large computer units and reams of paperwork which the old desk were designed for. Now I have worked in many offices, I still use a computer, a screen and have a few files here and there. I’m not suggesting getting rid of desks, but I would not need a two meter wide corner desk to work. I am suggesting that with the influx of new technology and popularity of social collaboration firms should work smarter when designing their workspaces to make them as efficient and as user friendly as possible. A smart hot desk is simple and effective idea. It is a desk that is set up for anyone in an organisation to use. Simple sit down, sign in and off you go. With the introduction of cloud servers, this means that if you have an office in Manchester, a colleague from Singapore could visit you and still be able to sign into their profile / domain to work. 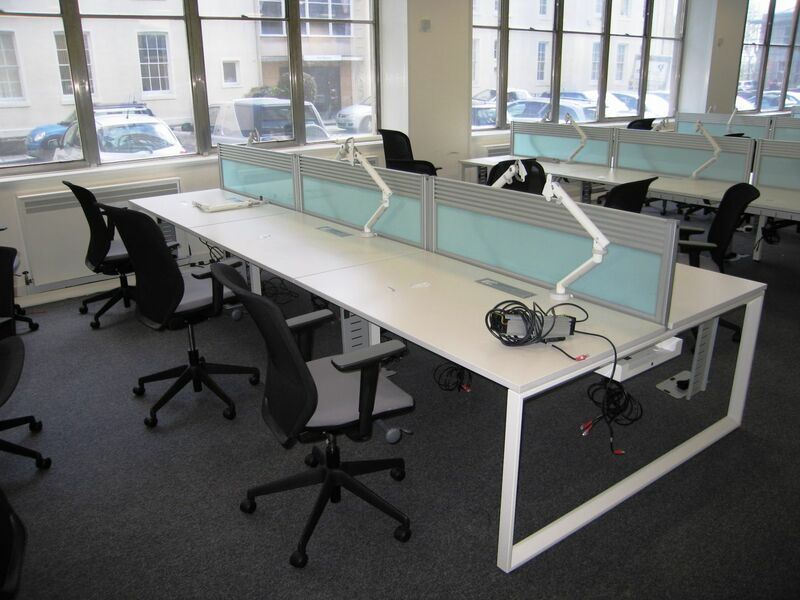 These desks are most efficiently used through what is known as a “bench desk” system. They are very contemporary and utilise space very well allowing multiple users to use one space as the metalwork underneath doesn’t get in the way of their legs. (Insert picture) Now humans aren’t robots so employees may be territorial and allocate themselves a particular space on these hot desks, however the footprint of space used compared to an old desk could be up to 60% less, making it a worthwhile investment. The idea of social hubs, breakout areas and soft seating meeting rooms are very initiative ideas. Many studies have shown workers are not efficient when stuck all day at a large desk by themselves. Informal and social spaces promote collaborative working allowing employees to share ideas and work in a more efficient ways. These spaces also act as focal point within offices. Many of which have creative and unique designs. Again studies have shown that the introduction of these types of spaces in offices boost motivation of employees, which in turn boosts productivity and efficiency. As you can see, it is very clear that with the way the modern workspace is evolving. Business are following in the footsteps of Google and Facebook creating more efficient workspaces and moving away from the old fashioned large desks and isolated working environments. I have only mentioned a few areas for ideas within this blog. If you would like me to let you know more about how Design Office Consultancy are helping businesses create change within offices please get in contact.